HoganWillig, PLLC is proud to announce that attorney Steven M. Cohen has just been awarded the highest possible Martindale-Hubbell® distinction by both his peers and the Judiciary! 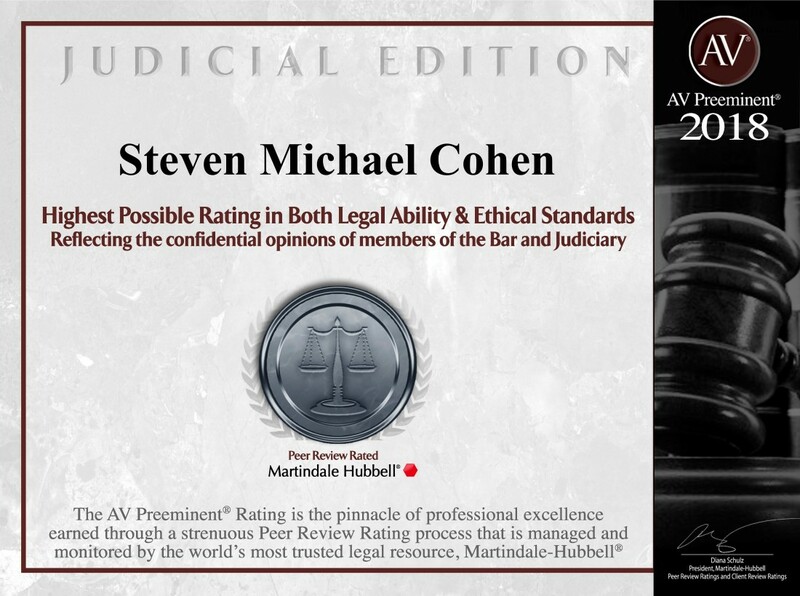 In addition to his continued AV Preeminent Peer Rating, the Judiciary through Martindale-Hubbell has given Mr. Cohen the Special Edition Judicial Award. The Special Edition Judicial Award of the Martindale-Hubbell® AV Preeminent™ is especially noteworthy because it is based on the confidential opinions and recommendation of members of the judiciary familiar with Mr. Cohen. The Judicial Edition award indicates perfect ratings from the judiciary on the attorney’s legal ability and ethical standards. For over 130 years, the Martindale-Hubbell® AV Preeminent™ Rating has distinguished the country’s elite attorneys. The Peer Review Ratings™ are an objective indicator of a lawyer’s high ethical standards and professional ability, generated from evaluations of lawyers by other members of the bar and the judiciary in the U.S. and Canada. The rating is only awarded to approximately 10% of all attorneys across the United States, and is the highest rating offered by the Martindale-Hubbell Law Directory.